One of the students pictured in racist post by the University of Mississippi journalism school namesake has spoken out. 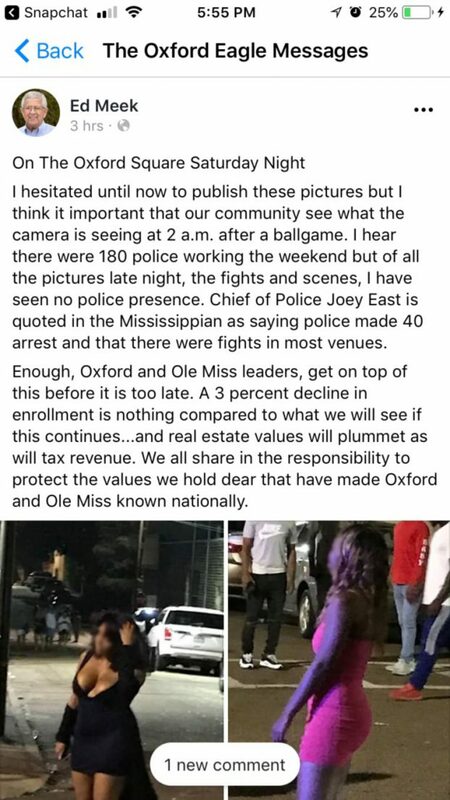 Edwin Meek, 77, the $5.3million donor behind the Meek School of Journalism and New Media at Ole Miss, shared pictures of Mahoghany Jordan and her friend Kiyona Crawford on Wednesday - alluding that their presence has led to a decline in real estate values and a decline in enrollment. Now Jordan has hit back at Meek, branding his post 'racist' and sexist. In an open letter in student newspaper, The Daily Mississippian, she wrote that neither she nor Crawford had any involvement with the 'fights and scenes' Meek discussed in his post. 'The post reeks of racist ideology as well as misogyny and is not representative of who either of us are, 'she said. She also rejected an apology from Meek. Meek led Ole Miss public relations for 37 years and donated $5.3 million to the university in 2009. Its journalism school is named for him. The row began after Meek shared photos on Wednesday night of the two black women, dressed in party clothes in the town square early Sunday morning following a football game. 'I hesitated until now to publish these pictures but think it is important that our community see what the camera is seeing at 2am after a ballgame,' he wrote in the since deleted post. 'I hear there were 180 police working the weekend but of all the pictures late night, the fights and scenes, I have seen no police presence. 'Enough, Oxford and Ole Miss leaders, get on top of this before it is too late. A three per cent decline in enrollment is nothing compared to what we will see if this continues…and real estate values will plummet as will tax revenue,' he said. Then he urged the city of Oxford and the university to 'protect the values that we hold dear'. His post immediately sparked outrage, racking up hundreds of comments with Facebook users pointing to his racist tone. Commenters noted that white women often wear similar outfits as the two black women in his post, but they weren't photographed or criticized, according to the Clarion Ledger. The school's Black Student Union says the juxtaposition implies real estate values are dropping because of the increased presence of black women. Following the online backlash, Meek deleted the post by 7.30pm, five hours after he posted. Following the controversial post the Meek School of Journalism shared a statement condemning Meek's statements. 'Earlier today, the donor whose name is on our school, Ed Meek, made a post on his personal Facebook account that we find highly offensive. This post is in no way associated with or represents our school, our students or our faculty. We are embarrassed by his actions,' the school say. An online petition has also been started, demanding Meek's name to be removed from the Ole Miss School of Journalism. 'This petition moves to remove Meek's name from the Department of Journalism program and the Department of Journalism building at the University of Mississippi in hopes of correcting the unjustified racial comments about African American population at the University of Mississippi and in Oxford to ensure a safe and inclusive environment for all students,' the petition states. So far 1,090 people have signed the petition, with a goal set at 1,500. Following the post Meek issued an apology on Facebook at 8pm. 'I apologize to those offended by my post. My intent was to point out we have a problem in The Grove and on the Oxford Square,' he wrote according to the Oxford Eagle. That apology has since been deleted. Jordan rejected the apology, writing: 'I don't need your apology. In fact I don't need anything from the reciprocal guilt you feel after being called out for what you are.